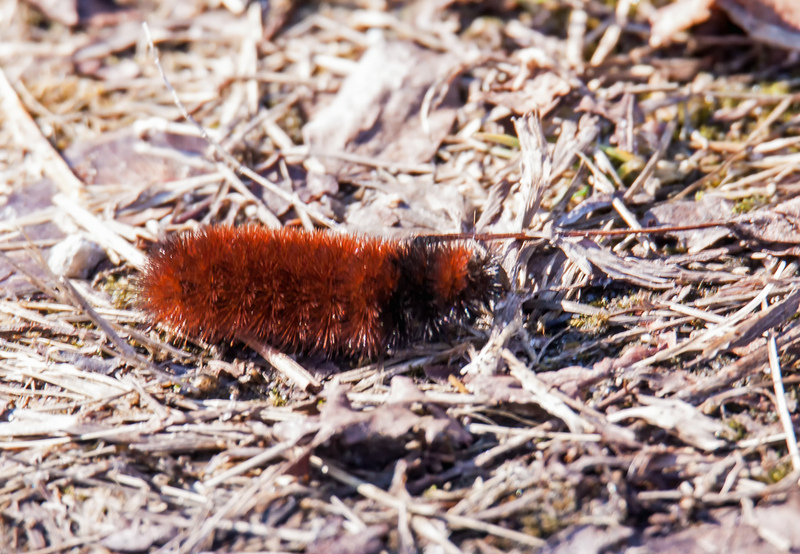 On Monday I was really surprised at Occoquan Bay National Wildlife Refuge to photograph my first insect of 2019, a Woolly Bear caterpillar (Pyrrharctia isabella). This species overwinters in its caterpillar form and survives being frozen by producing a cryoprotectant in its tissues that protects its cells from damage. It can even be found in Arctic regions. This caterpillar was unfrozen and moving about, but it is probably too early for it to become a moth. Most of us are used to seeing this caterpillar, which is also known as the Banded Woolly Bear, in the autumn. There is quite a bit of American folklore associated with predicting the severity of the upcoming winter on the basis of the colors and sizes of the stripes on the caterpillar. If you want to learn more about how the overwintering Woolly Bear caterpillar and how it survives the winter weather, check out this fascinating article at infinitespider.com entitled The Woolly Bear Caterpillar in Winter. So much for the weather predicting capabilities – this guy is signalling a mild winter. From what I have read, there is no scientific basis for the practice of measuring stripes to predict the winter weather. I must confess that I can never remember what the rule was supposed to be.